Point Pleasant sophomore Kyelar Morrow (2) releases a shot attempt during the first half of a Jan. 11 boys basketball contest against Hannan in Point Pleasant, W.Va.
INSTITUTE, W.Va. — Better late than never. 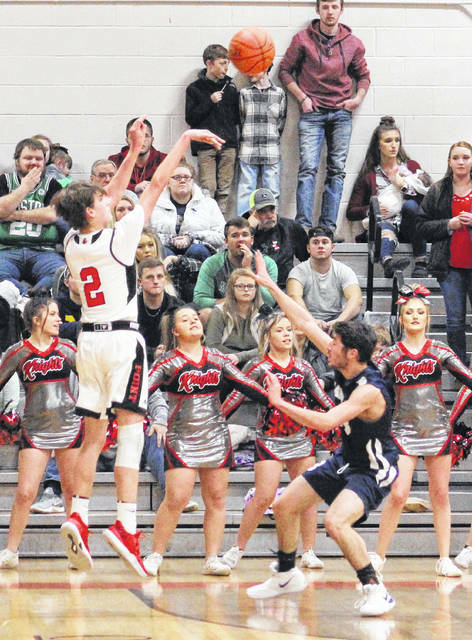 The Point Pleasant boys basketball team made a 45-32 charge after halftime and ultimately picked up their first winning streak of the season Wednesday afternoon with a thrilling 69-64 overtime victory against Man at the 2019 Little General Shootout held at West Virginia State University. The Big Blacks (4-12) found themselves in an early seven-point hole through eight minutes of play, then the Hillbillies (9-9) used a small 13-12 spurt to extend their lead out to 32-24 at the break. Hunter Bush nailed two trifectas and Kyelar Morrow added five markers as part of 17-15 run that allowed PPHS to close to within 47-41 entering then fourth, then Bush tacked on another nine points during a 17-11 charge that allowed the Big Blacks to knot things up at 58-all at the end of regulation. Bush, Morrow and Aidan Sang each hit a 3-pointer in the extra four-minute session, then Braxton Yates converted two free throws to complete an 11-6 overtime charge that wrapped up the five-point triumph. In a game that featured 27 made 3-pointers, it was the free throw line that ultimately decided the final outcome. The Red and Black made all seven of their charity tosses, while MHS came up empty on all five of their tries. Point Pleasant made 23 total field goals, 16 of which came from behind the arc. The Blue and Red, conversely, netted 25 total field goals — with 11 of those coming from 3-point territory. Bush paced PPHS with a game-high 32 points, followed by Morrow with 20 points and Yates with 10 points. Sang was next with five markers, while Trey Peck also tacked on two points to complete the winning tally. Zach Cook led Man with 20 points, followed by Austin Ball with 19 points and Matt Spaulding with nine markers. Quentin Moody was next with six points, while Caleb Blevins contributed five points. Andy Spaulding and Ryan Cozart completed the scoring with three and two markers, respectively. Point Pleasant returns to action Saturday when it welcomes Gallia Academy in a non-conference contest at 6 p.m.